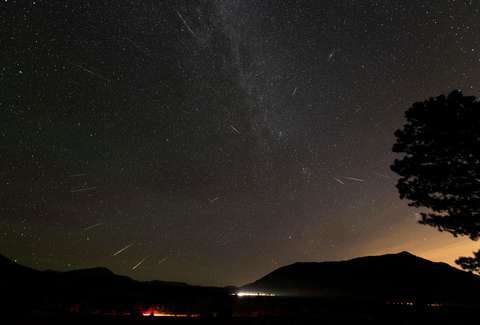 The Final Meteor Shower of the Year Arrives This Weekend. Here's How to See It. The last meteor shower of 2018 is here, and it peaks right on the Winter Solstice. The Ursids meteor shower will be at its most spectacular on the night of Friday, December 21, into the morning of Saturday, December 22, bringing a hail of shooting stars to your holiday weekend festivities. It's your final chance to be wowed by space this year, so there's good reason not to miss it. However, the display has justifiably been labeled "the cursed Ursids," Bill Cooke of NASA's Meteoroid Environment Office tells Thrillist. They arrive alongside frigid winter weather and just days before Christmas, when many people are preoccupied with other activities, like stressful last-minute shopping. They are stargazers' forgotten middle child, begging for a little attention. Moreover, the Ursids don't normally produce a copious number of meteors. It's a moderate storm, except when the display is in the midst of an outburst year. Fortunately, Cooke says the Ursids "may outburst," meaning the storm could produce 30 to 40 meteors per hour at its peak. Unfortunately, since the Ursids don't produce bright fireballs and peak the night of a full moon, many of the meteors will be washed out by the bright light. The shower is really working for that "cursed" label this year. But that's no reason to give up if you're hellbent on catching some meteors zip across the sky. When will the Ursid meteor shower peak tonight? It's not going to be a great year for Ursid viewing despite the potential for an outburst. Since the peak lands on a full moon, it's worth noting that the Ursids are expected to send some meteors across the sky -- though, not as many as there will be at the height of the storm -- from December 17 through December 25. However, the Ursids have a sharp peak, meaning there are many more meteors on December 21-22 than in adjacent days. The best time to get outside to catch the peak? Sometime between midnight Friday and sunrise on Saturday, according to a report by space.com. In other words, you have time to take a quick nap before you head out into the cold. Or maybe that time is better spent preparing a few flasks of hot toddies? Where will the Ursid meteor shower be visible? As always, you'll need the sky to be clear in addition to being dark. Any sort of cloud cover will ruin your viewing experience. Also be sure to avoid areas where tall trees or structures will block your view of the sky. You want to be able to see as much of the sky as you possibly can. Here are a few more tips from the folks at NASA's Jet Propulsion Laboratory: "It is winter so bundle up if you want to watch for meteors, as it is getting late in the year! Get to a dark spot, get comfortable, bring extra blankets to stay warm, and let your eyes adjust to the dark sky. A cozy lounge chair makes for a great seat, as does simply lying on your back on a blanket, eyes scanning the whole sky." The radiant point (where the meteors appear to emanate from) is the constellation Ursa Minor, or the Little Dipper, in the northern sky. With any meteor shower, it's advantageous to locate the radiant, but you shouldn't look right at it. The meteors are moving away from the radiant, so you should look slightly away from that point. So, lean back and give yourself a view that takes in as much of the sky as possible. You'll want that when watching a display that doesn't produce as many meteors as, say, the Geminids earlier this month. That show was spectacular, where the Ursids are definitely not going to make anyone think we're in the midst of an alien invasion. Then again, you'll probably end up appreciating getting to see each meteor when there are fewer of 'em, right? We're trying to see the bright side here, folks. What's the deal with the Winter Solstice and the full moon on the same night? The peak of the Ursid meteor shower falls on the same night as both the winter solstice and a full moon. Like with any instance of celestial events aligning in some way or on the same date, there are people who are reading into the potential magic of it all. But we won't get into that. If anything, the full moon and winter solstice are bad things, when it comes to experiencing the meteor shower. As we explained above, the full moon will do nothing but wash out the few meteors plummeting through our atmosphere, and that's certainly not great if you're already in a location with additional light pollution conditions. The winter solstice is the official arrival of midwinter, when Earth's North Pole reaches its maximum tilt away from the sun. It's the day of the year with the shortest amount of daylight and the longest night. So, really, it's just another reminder of how frigid it'll likely be outside, though it won't necessarily be the coldest day of the year. The Ursids is sadly the last meteor shower of 2018. But you have plenty to look forward to in 2019. The first major meteor show of the new year, the Quadrantids, will peak on the night of January 3 into the morning of January 4. But like the "cursed Ursids," you'll still have to brave the cold and crappy winter weather if you want to see anything. That won't change until the Lyrid meteor shower peaks in late April.